“So when are you going to move in?” Ummm, a year ago? “Horse manure? You built your house out of horse manure?” Yup. I didn’t know what I was doing. I thought that after building a wood shed and a deck, it wouldn’t be that much harder to take on an actual building—just a little 200 sq. ft. cozy home using volunteer labor and all local, natural, reused, creatively-sourced materials. Silly me! I’m writing this article now to share tidbits that I wish I knew before I started building the Mini Moon. When I began this project, I suddenly became a general contractor for a project way beyond my abilities. The project I thought would take a summer is now two years long (and counting). Every time I meet a builder, I fall to the ground in respect: I had NO IDEA how complicated a building was. Every single inch taught me a new book of knowledge and complexity—how to space rebar in a concrete foundation (that you even need rebar! ), how to estimate how much space 10 tons of small stones will fill (for the drain) and what kind of dump truck can be driven backwards down a long dirt driveway, what happens if you are a half-inch off in the length of some boards, what product will stick to windows and earthen plaster to be a flexible flashing (what flashing is! ), what can be used to create a round gutter, what’s the difference between nails and screws…and on and on. And the labor! So far, I’ve had over 300 different people put their hands into this project. That’s a lot of advertising and coordinating work parties. So while I was learning how to be a contractor and builder, I also put on my community organizer hat to recruit a nonstop flow of volunteers. Now I have 300 new or deepened friendships! For years I’ve hung out with natural builders at my community and around Portland, Oregon (a hotspot of urban natural building) yet I’d never actually done much of the physical work. 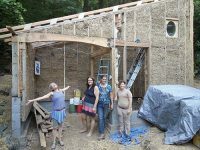 I was more of a talker, and even went on a national speaking tour about the community- and relationship-building power of natural building (many of you have heard about the Village Building Convergence). Now, I finally get it. It’s awesome. Every inch of this building is woven with relationships, conversations, learning, sharing, loving touch. The Mini Moon is a 200 sq. ft. light straw-clay, cob, and recycled wood building with electricity but no plumbing. It’s a satellite bedroom and mini-community center. I designed it specifically to have a dozen people in a circle for a meeting, good lighting and movable tables for art parties, the proper electrical lines to be a small music recording studio (foot-thick earth walls make the best sound quality! ), and space for overnight guests and cuddle piles. I am community through and through, and my deepest hope was that the Mini Moon became a hub for community activity. And it is working! Context is key. I live at Tryon Life Community Farm (TLC Farm) in Portland, Oregon, a seven-acre public nonprofit community education center. About 18 of us live here within two residential collectives (The Bridgewalkers Alliance is specifically for people of color and trans folk; I am part of the other collective, Cedar Moon). On this land we host many events, workshops, and retreats. So when I called for workparties every weekend for two years, many people already had a relationship with this land and community, and for new folks TLC Farm was an attraction. I hosted over 125 public workparties in 20 months. I rode the Facebook wave. I created a buzz and kept my public story consistent—for two years, my FB feed was a broken record. I posted a lot of photos, each time with a call to the next action: Come to the workparty on Saturday! Who has scrap plywood? Anyone know of a place to get reused windows? It worked. Everywhere I go, people ask me about the project, comment on how hard I’ve been working, that it’s taking so long (yeah, thanks, I know), and that they really want to help. It’s created a buzz that people want to be part of. And yes, it’s hard to keep asking for help. I was embarrassed at times. But every time I asked, people showed up. And had a great time. And told me that my persistence was inspirational. So I kept asking. I’ve learned that it’s OK to ask because people will say yes when they choose to. I made sure to show my gratitude, explain how they made a meaningful impact on a big project, and tried to make it fun! It feels better to give than to receive, so when you find yourself asking for help, a lot, remember that you are also offering the opportunity for people to feel connected to something special. People who show up at workparties are cool. They are ready to work and I learned that I don’t have to provide a lot of bells and whistles to make the experience meaningful. They came for a reason—to learn a skill or participate in a community activity or do something outside, not because I had great snacks or a live band (which I thought I’d have at every workparty—ha!). People gave me a lot of great feedback about how I hosted workparties; here are some things I learned. My number one suggestion is to take time to share a warm welcome and a grateful goodbye for every person who shows up (details below). My number two suggestion is to be prepared! Know what you need to do that day and have the tools and materials at hand. No one likes to show up ready to work and then wait while you awkwardly fumble around. Food. After the first couple workparties I got real about my ability to provide food so I always said to bring a lunch. I provided at least some snacks, but most people were perfectly happy to provide for themselves. Workplan/timing. Tell people exactly what they are in for, and if there will be options for folks of different ages/abilities. Have clear start and end times and stick with them. Kid friendly? Make this explicit. Don’t assume that kids will get in the way; in fact, they can be the most tenacious workers and creative visionaries, and I find that parents who bring kids to construction parties are damn cool and ready to work hard. Dog friendly? I invited only dogs who could happily hang out on a leash. Introduce myself with my gender pronoun (more on this below) and offer a warm welcome and gratitude for them showing up. Find out what brought them here today. Give a quick tour: big picture vision, what we’re doing today, and how they can fit in. Sparkles! At this point, they have received a lot of information, and I wanted to give them a quiet moment to take it all in and make a personal connection to the project. So, I gave them a pinch of sparkles (yes, I know, I know, microplastics…) to put anywhere they wanted in the project and I asked them to offer an intention for their work here today, or a blessing for the space, or TLC Farm, or the world: “Add your own bit of sparkle to the dirt!” Then I left them alone. I found that after people took a moment alone, they felt relaxed, happy, intrigued with my strange building site, and ready to go! ● Meaningful work, something for everyone: Some parts of the project lent themselves more easily to all-hands-on-deck-super-fun work, like building straw-clay or cob walls. Other days were more technical or heavy lifting. But no matter what, I always had a plan in my back pocket for someone with either less or more physical ability or knowledge. I tried to put everyone to use in appropriate ways. It felt good to have choices to offer. ● Realistic and successful work: Even on days where it felt like we trudged through only a small amount of work, I always made sure to celebrate what we accomplished. Everyone wants to feel their contribution was meaningful and that they helped out. ● Community questions/conversations: Inevitably people ask a lot of questions about the intentional community and education center. “So, how many people live here now?” is almost always the first question. I learned to anticipate the basics, share them up front in a condensed form, and politely say that I’m happy to answer more questions as we work or on a break. I also shared upcoming TLC Farm events and encouraged them to walk around and check the place out. ● Photos: Since Facebook advertising was so important to me, and I wanted to document the project, I took a lot of photos. It’s very important to ask: Is it OK if I take your photo? And can I post it on FB? ● A warm and connective goodbye, with gratitude: Just as when folks arrived, when they left I always took a moment to stop, look them in the eye, and thank them for their contributions. These are very meaningful moments! ● Sparkle in, Sparkle out! Just as they took a quiet moment to “sparkle in” to the project, I asked people to “sparkle out” by signing my “Purple Sparkle Participation Book.” In my little dirty sparkly notebook, I asked folks to sign their name and date, and whatever else they wanted—what they did that day, what it meant to them, etc. This helped people solidify the feeling that they were part of something special and to reflect on their own journey. An unexpected aspect and extremely meaningful part of this project was learning how this building site became a safer space for people who identify as gender non-binary and/or trans. At least a dozen participants thanked me—and kept showing up—because they had been wanting to learn these skills and had not felt safe or comfortable at many other building sites. Building is a cis-male dominated world and not only was I a woman running this show, but I also made sure to include gender pronouns in introductions, and to do the work to teach folks who had never encountered concepts like gender non-binary. I used my gender privilege and workparty leader-power to intervene and gently teach cis-people if they seemed confused, used incorrect pronouns, or asked inappropriate questions. Again, context is key: TLC Farm is known as a gender-variant-supportive place, due to the Bridgewalkers Alliance residential collective and monthly “Tranimal Nature” events on the land. Many folks from these communities came to my workparties. As a cis-woman, I was humbled to spend many hours over dozens of workparties hearing about their gender-related experiences in the world and at other building sites. I recommend for any workparty host to learn about the importance—and nuances—of including pronouns in introductions, at least as a start for creating safer spaces. I’ll be honest: this project was hard on my community. Not only did I disappear from other responsibilities on the land, but I also constantly asked for help and spilled stressful energy to my community-mates. When my community agreed to this project, they anticipated my physical and emotional stress and asked me to incorporate rest days and a daily practice into my schedule. I didn’t. I let the stress consume me and obsessively kept working. I always felt like I was racing the rainy season. Every week, I needed to plan a workparty, learn the skills needed for that weekend, advertise, prepare snacks and materials, and then do the work. I was constantly exhausted, had trouble sleeping, and broke down crying a lot. My community-mates saw that I got myself into something way over my head and gently tried to slow me down, but I didn’t listen. Many workparty folks asked why my community-mates weren’t joining in. I explained that they did a lot of late-night truck unloading and random heavy-object moving for me, and that they were there when I really needed it. If you live in a land-based intentional community, you know that there are endless projects and responsibilities. I didn’t want to ask more of my land-mates; I was appreciative that they kept things going while I was focused on the Mini Moon. But an element of resentment also grew, both directions. They were frustrated at my stress and non-involvement in things like weekly cooking chores, and I got sad when people didn’t help at my workparties. By the second year, I think my community arrived at some kind of balance. The majority of the work was done by me and off-site people. We realized that I was fulfilling TLC Farm’s educational mission by having consistent natural building workparties and lively activities almost every weekend. I brought a lot of new energy and attention to the land project. And hopefully in just a couple more months, I will be done and can re-involve myself in the rest of the community work. Plus, the Mini Moon is already starting to function as a mini-community center, which my land-mates are now discovering as a lovely place for meetings, quiet work, and connective conversations. Even though I thought this would be a summer-long project and it turned into a ton of stress and work over two years, I am so happy with the Mini Moon. At this point, I just laugh at how long this is taking. As someone said to me, every workparty adds more love to my walls—more fun and great people. Now, I am a builder and this house is truly a community space—a beautiful, hand-crafted, relationship-full, cozy home for gatherings. I am humbled and honored to steward the Mini Moon! Jenny Leis has always lived in community, most recently for 13 years in Cedar Moon, part of Tryon Life Community Farm in Portland, Oregon (www.tryonfarm.org). She loves bringing sparkle to the dirt! Reused wood: It takes five times longer than new wood to source, pull out nails, avoid broken screws when cutting, deal with warped and mismatched boards…but it is so damn satisfying! There is so much scrap wood in cities! Neighbors have little piles left over from projects, new buildings have trash piles, dumpsters are gold outside of a remodel (old growth 2x4s! ), and builder-friends often have extras. Friends would keep an eye out and text when they saw a fantastic free pile of wood—that’s how I got my live-edge gorgeous trim! Clay, sand, straw: Every location is different so I will defer to all the natural building books to tell you how to do a soil test. Useful hint: find a pottery maker with clay scraps. Hardware: You probably want to buy your nails and screws new and you will probably end up needing a ton more than you think. Invest in the giant boxes! Costs of hardware really add up! Styrofoam, gooey chemicals, Tyvek, tar paper, and other yucky stuff: Sometimes you just gotta use plastic/oil products, but the good thing is that I could reuse other people’s leftovers. Best creative reuse story: my neighbor had Structural Insulated Panels sitting in his backyard for 10 years. Now, my “Cozy Cob Corner” ceiling is insulated with eight inches of styrofoam—a perfect example of using something un-enviro-friendly that would otherwise rot in a forest or landfill. Windows: More expensive than I anticipated, even used. Hard to get the same size so why not make them all different sizes? Tip: there are a lot of interesting-shaped large windows that get thrown out, so if you plan to have a big or odd window, find it early in your design process and design the wall around it! Sparkles: OK, so I know that microplastics are evil, but I really love sparkles. Every inch of this building has layers of sparkles built into it. I even took small handfuls and carefully blew them onto the wet plaster, inside and out. They are magical at night when they glint in light! I was told that you can have two of the magic three: good, fast, or cheap. I still wanted all three. “They” were right. I ended up letting go of the “fast,” since I stuck with my value of finding used materials, which took a LOT of time on Craigslist and Facebook, and driving around town. At the end of this project, I expect it to total about $18,000. This includes about $7,000 for consulting support and labor (at a few key moments, we hired some friends) and about $9,000 for materials. I also put in over $2,000 for gas/driving, snacks, and odds and ends. I didn’t count my personal expenses—endless hours, many days of missed work, health care costs for hurt body parts—and the time of my superstar volunteers. Not counted: Snacks, gas-mileage, or the value of my time, volunteer time, and all of the free materials!